The fishing industry is evolving; for most fisherman, knowing how to catch is no longer enough. New regulations, growing demand from consumers to know where their food comes from, rising fuel prices, and increasing globalisation have changed the business dynamic of fishing. At the same time, with many fisheries in decline, fishermen must develop new ways to fish without depleting the resource on which they depend. They must innovate to survive. To be successful, they need to focus on developing their businesses as well as fishing. This new reality for fishermen is one that is familiar to me. I had experienced problems associated with understanding only the science, and not the business, side of growing a resource-based enterprise during the early part of my career. At the time, I was working in a marine science job with a venture capital funded company focused on creating pharmaceuticals from unusual marine organisms. Though our research team successfully found useful organisms, the company went bankrupt in just two years. The management could not satisfy the investors – even though the results looked promising. Frustrated, I went to business school to learn how to better manage scientific organisations like the one I had worked for. At business school, I learned that each element of business, whether finance, marketing or strategy, has its own language, and that there are common rules to follow, no matter what the business or where it is in the world. As in all languages, the art is in how you adapt and combine all of the elements in different contexts and situations. After finishing school, I tried to apply my knowledge of this new language to ocean sustainability – where too few people in science, conservation, and small scale fisheries spoke it. Along the way, I met many fishermen and fish farmers who were working to build innovative enterprises. Most were frustrated by their interactions with the investors they approached for support. They felt unable to build the trust, relationships and knowledge needed to work together. Conversations with investors were short and led nowhere. After several years of writing business plans for some of these emerging fishing businesses, I realised that I could not meet the growing demand. To make an impact on the ocean, I needed to solve the problem at its root: investors and fishermen needed to learn each other’s languages, so they could communicate effectively and directly. I developed Fish 2.0 to bridge this language gap. I kept the platform simple – a business competition for sustainable seafood. Under its umbrella as a competition, Fish 2.0 connects entrepreneurs, investors, and sector experts. It teaches the language of the seafood sector to investors and the language of investors to sustainable seafood businesses. By doing so, Fish 2.0 starts conversations and builds relationships. The intention is to create support for sustainable seafood entrepreneurs and to bring investors opportunities to create profits together with positive social and environmental impacts. My team launched the first competition in 2013, building connections among 200 participants and over 1500 observers. Participating businesses ranged from a large-scale aquaculture operation to a small-scale, fishermen-led distribution firm. Entrepreneurs came from places as far away as Turkmenistan, Japan, and Angola as well as the UK, US and Canada. And they presented innovative ideas in all areas of entire seafood supply chain. Investors came to the competition with no experience in the seafood industry and skeptical about the opportunities. They are now actively involved with fishery and aquaculture businesses. We built a growing network of investors, businesses, and experts who share a passion for ocean conservation, entrepreneurship and helping people who are trying to do the right thing. 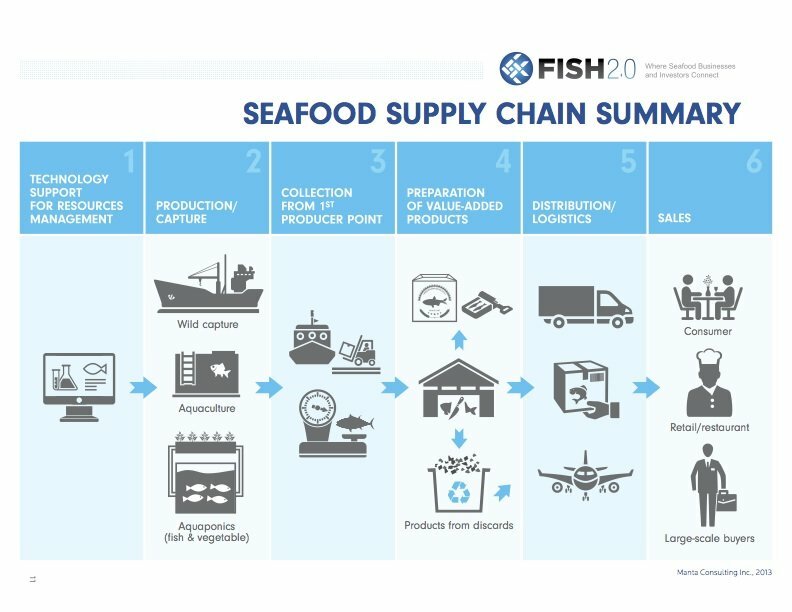 The icons in the diagram above show the different touch points of the supply chain where Fish 2.0 entrepreneurs were focusing. In 2015, we plan to expand Fish 2.0 to see where this new conversation can take us and if we can hit on even more touch points for innovation in the industry. Please join us in this discussion and spread the word about Fish 2.0 to investors and seafood business owners who might be interested. You can connect with us to learn more and get involved. 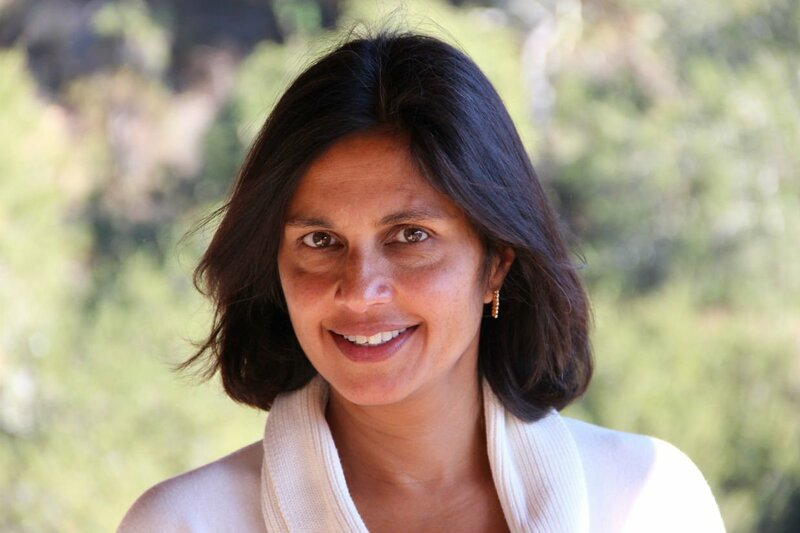 -This is a guest blog by Monica Jain. Monica is founder and Director of Manta Consulting Inc. and the Fish 2.0 Business Competition. She specialises in the creation of innovative financing strategies, metrics and structures for conservation and social investment projects. June 8th is World Oceans Day. It is an opportunity to celebrate the world’s oceans but also raise awareness of the challenges our oceans face. -Images in article from Monica Jain.